Small tattoos are often placed on people who are being inked for the first time. These types of tattoos can be simple or intricate, and lend themselves well to placement on smaller parts of the body. Small does not have to mean boring, these mini works of art can be quite colorful and unique. A tattoo is a permanent body modification. The decision to get a tattoo should be taken seriously, even if you are only getting a small one. If you are just wanting to "try it out", or you have any doubts about having a tattoo, consider using some temporary tattoos until you are certain that body art is for you. When you are looking for a design for your small tattoo, you may wish to draw a circle around the area you are planning to place it. Keep in mind that simple is better. Some larger designs may be scaled down if they are not too detailed. Small tattoos can have a big effect with the right amount of detail and a strategic body placement. Finding the right artist is important no matter what the size of the tattoo you are planning to get. You are going to live with it every day, so it is a good idea to love it. Ask people who have small tattoos who did their work. Take a look at the photos your prospective artist's previous work with smaller designs. 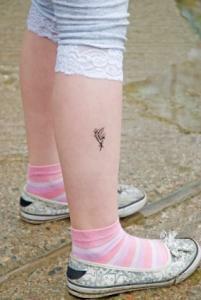 Other places on the body are also suitable for this type of tattoo; the ankle and lower leg are a popular place for them. Small tattoos are often found on shoulders and chests as well. Consider whether you will need to cover the tattoo for certain circumstances and the general shape of the tattoo to help you make a good body placement choice. If you are not sure where it should go, talk to the tattoo artist you have selected. The artist should have a good eye for symmetry and be able to give you useful suggestions. A few people may stop at just one tattoo, but it is rare. Most people who get one tattoo find that they really want another, or may wish to extend the picture and add elements to make a smaller tattoo into a larger one. This is especially true if you have a good relationship with your artist. When the minds meet, the ink and skin seem to blend well also.